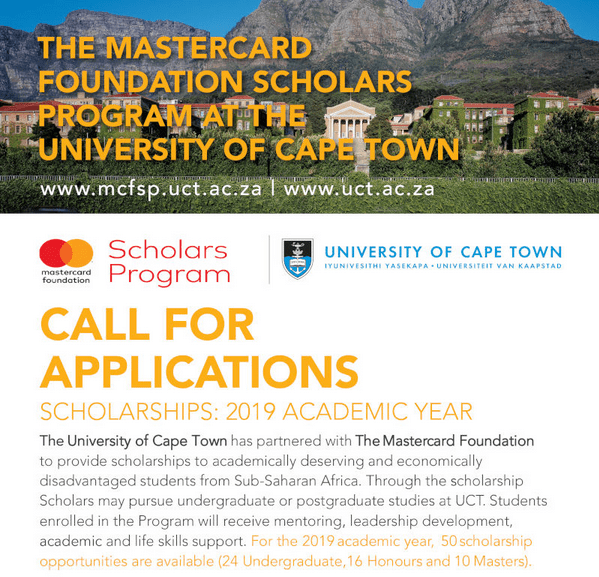 The Mastercard Foundation has partnered with the University of Cape Town (UCT) to provide 338 scholarships over 10 years to academically talented yet economically disadvantaged students from Sub-Saharan Africa for study at UCT. The Scholars Program is a $700 million initiative to educate young people – particularly from Africa – to lead change and make a positive social impact in their communities. Scholars will receive comprehensive scholarships, academic support, peer mentorship, career guidance, internship opportunities, transition-to-work support and access to a global alumni network. Over the 10-year period (2014 – 2024), sixty students will be awarded scholarships to complete an undergraduate qualification and 240 students will be awarded support to obtain qualifications at Honours (as of 2016) and Masters level. In order to be considered for the scholarship, applicants must meet all the eligibility criteria, including the admission criteria for their chosen course of study at UCT. The scholarship’s tenure is for the full period of the academic program for which the Undergraduate Scholar has enrolled, with the second and subsequent years dependent on satisfactory academic progress and co-curricular involvement. Tenure for the Honours level scholarships is one year. For Masters level the scholarships tenure is two years, dependent on academic progress and co-curricular participation of the Scholar. Review the study options and admissions requirements at UCT and decide which faculty and degree programme you wish to apply to. Obtain proof of English language proficiency (see How to Apply for further instructions). Write the National Benchmark Tests (for applicants from South Africa, or if you are an applicant from any country and intent to the Faculty of Health Sciences). Collate the necessary documentation to support your application, including evaluation of any previous university level qualification by the South African Qualifications Authority, additional portfolio requirements for degrees in Fine Art or Architecture, and matriculation exemption documentation. Apply online for [email protected] for assistance. Previous articleYouth Peace Initiative Youth Carnegie Peace Prize 2018 for young peacebuilders worldwide.